“The days are just packed!” Calvin & Hobbes would say. And they are. So you need take time for the little moments – with family or friends or simply with yourself – in between the rushed seconds and the quickly passing days. The mornings are dark when we wake up now at 6 AM – I’ve been lighting candles and enjoying a few quiet moments with my cup of coffee before the day begins. The evenings are dusky but not dark when we sit down to dinner at 6 PM, and I try to make/take the time to cook up something to warm the belly so we can enjoy a simple yet satisfying dinner together. On the busiest of days, I am reminded that good food eaten while sitting down together is an important part of a balanced day. Some foods make it easy – especially when the oven does the work, as with so many root vegetables. Of all the root vegetables, I love beets the most. This year was the first time I’ve ever tried to grow them and I opted to try the traditional dark red beet as well as the charming pink and white striped showoff beet called Chiogga. I was lucky: a mild summer full of warm rainy days meant very little hand watering at the cabin garden and a big pile of chubby beets to take home at the end of the season. If you visit a farmers market now, you’ll see mounds of beets piled up on the tables. Grab yourself a small bagful and prepare to make the perfect side dish. These roasted beets are dead simple to make, take 5 minutes of prep time and 1 hour to roast, so you can do all kinds of things in the meantime. And they are so good you may want to eat them standing up at the stove, dripping the beet juices back down into the pan you cooked them in. If you have leftovers, the are great sliced cold over a nice green salad with a bit of goat choose and a drizzle of aged balsamic an good extra virgin olive oil. I rarely have extra, though, unless I consciously cook an abundance of them and hide a few before they hit the table. Place the beets into a ceramic oven-proof baking dish. 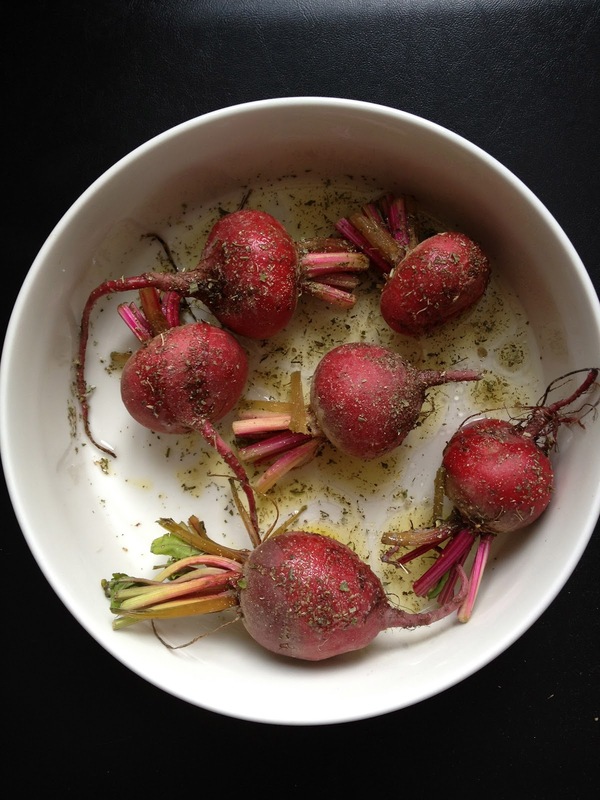 Pour in the water, drizzle beets with olive oil, and sprinkle with the Herbes de Provence, sea salt and black pepper. Toss to coat the beets thoroughly. Cover the pan with aluminum foil or an oven-proof lid and bake at 200°C / 400°F for one hour or until the beets are tender when pierced with a fork. Remove from oven. Allow the beets to cool for five minutes. Being careful to leave the stem of the beet greens intact, carefully remove the skin with the blade of a sharp paring knife – it should come off easily in a thin layer. Serve as a side dish. Serves 2 – 4, depending on the size of the beets – and your appetite!